Growing up, I thought of paper-mache as the ultimate find in crafty materials; the smells, the textures, and most of all the ability to form into anything you so please. It's basically a child's paradise and I kind of miss those days to be honest. Historically as a tool, it has been around almost as long as paper itself which was invented in China in the 2nd century AD and spread out from the Far East. The concept of papier mâché came as a result of a clever way of reusing the material as the human race was decidedly less wasteful then. The lightweight yet strong material proved successful for a variety of interesting items, anything from furniture to the 17th century art of cartapesta or papier mâché in the heart of Puglia and the southern regions of Italy. Though as early as the 15th century there are traces that it was already in use. In city's like Lecce, it was considered to be an affordable resource. The items made from cartapesta held the ability to resemble a marble statue, yet were much easier item to carry during important religious processions through the city or used to create seasonal nativity scenes. The material is made from paper pulp, glue and water, which is then pressed into a mold and boiled. After, it can be used to make a wide variety of items, sculptures, carnival masks or floats and much more. As per an art form, it’s strength and durability is long lasting, allowing for artists to shape paper into any form they see fit. And quite frankly, the results can be astonishing. In the heart of Sicily, exists one such man considers himself more an artisan than an artist. 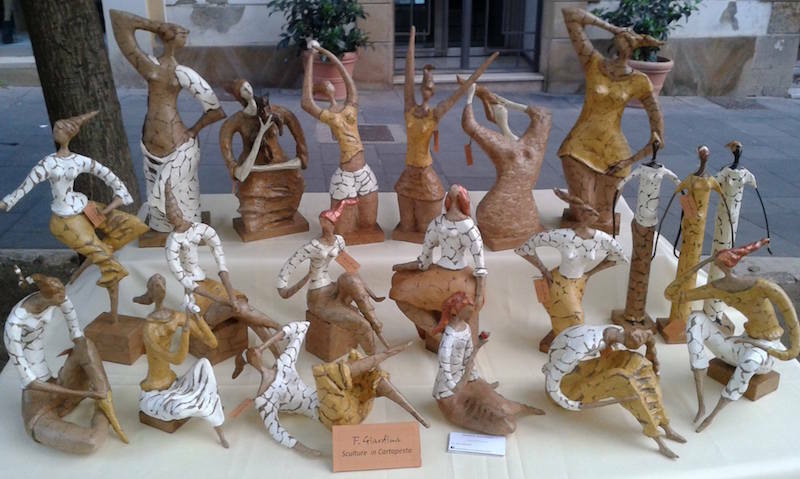 Fausto Giardina has been sculpting (and dreaming) since he was a small child, when he first started by using the clay from river embankments to form all sorts of sculptures. This playful creative side intensified as a passion as he grew older, one of which we can clearly see in his work (below). We carry several of his lovely handmade sculptures in our e-commerce shop, which gives artisans like him an outlet to showcase and sell their work to those who appreciate the time and work involved for such pieces. They make wonderful gifts or home decorations which carry not just the outside appeal, but a knowledge that there was a man who's dream created that artwork via a painstaking process that often takes up to 10 hours to complete. I had the chance to chat a little further with Fausto about his expression through art, which you can feel in every embodiment of his “little women” sculptures that I personally adore and I know you will too. Why did you choose to do this work? Was this a family tradition or part of local culture of the region? I love and believe in what I do which is the only thing that can really do me good. Art is a gift that has always been present in my family. My grandmother for example is a self-taught painter and sculptor. Even my Sicily has been a wonderful source of inspiration, thanks to its long artistic tradition. Certainly an artist must always try to make an effort to create their own, recognizable, style among others who are creating similar works. For this reason I have been working for many years with papier mâché, perhaps a not very popular material in sculpture, but one where I can make a mark using this expression that I adore. When it comes to designing a project, where do you start? I never manage to improvise in my work, I always start from a basic idea which takes shape through a series of studies and sketches on paper. Then I move on to the actual phase of production. How many hours does it take to create one of your works? It really depends on the complexity of the subject. What varies how many hours worked is the size and decorative details of each sculpture. On average, I spend around eight to ten hours working on any given project. 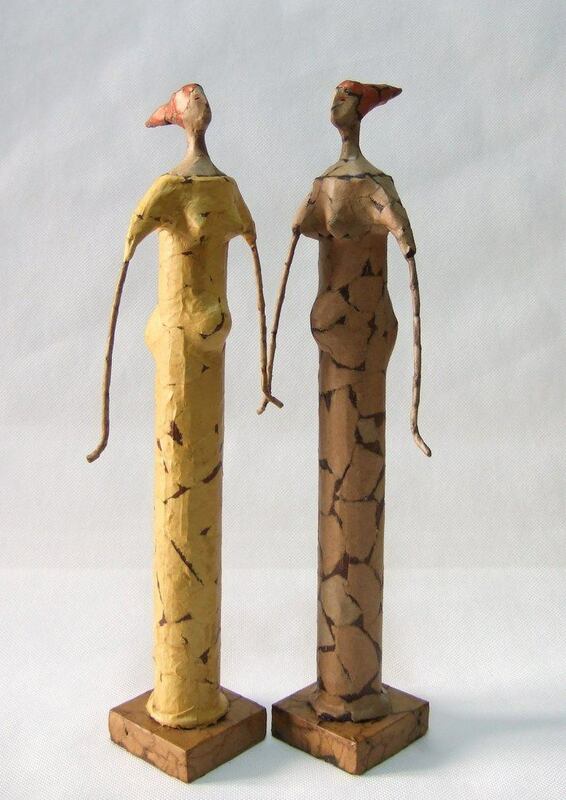 Fausto's "Couple" is a paper mache sculpture, decorated with acrylic paint and finished with transparent matte and a wooden base. During this somewhat difficult economic period, what ae a few difficulties you encounter in your work? To live on your art alone is extremely difficult. And establishing yourself in this type of market can lead to a steep path of hostility and disappointment. You have to really and truly believe in yourself, continue creating your art and and never get demoralized. How have you found people reacting to your work? Do they appreciate the work behind the items? My creations give me a lot of satisfaction when they are presented to the public. I get a lot of compliments. Can you share with me a few ideas for future projects and development of your craft? In the future, I’d like to invest more in the internet. I think for a craftsman who wants to sell his work around the world, it’s an opportunity to have a pool of a truly unlimited audience. In the meantime, I will continue working on my sculptures, always trying to give emotion in my work. Browse Fausto's wonderful sculptures and home decorations in our shop here, and make sure to visit the rest of our awesome made-in-italy items.